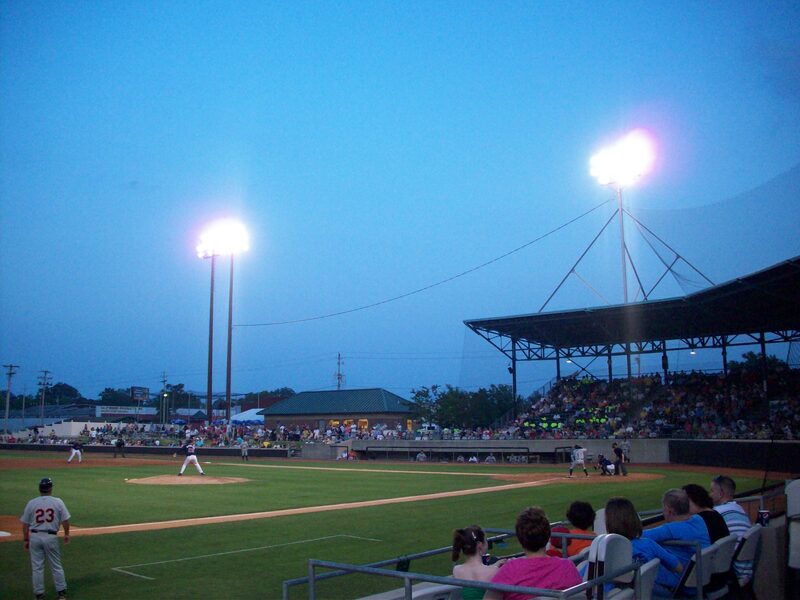 Ballpark Basics: The second oldest ballpark in the Carolina League. 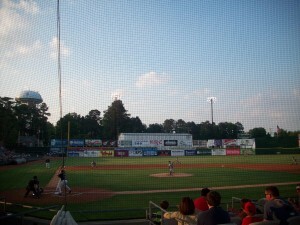 *Since our post was originally published, the Indians have moved to Zebulon, NC as the Carolina Mudcats. 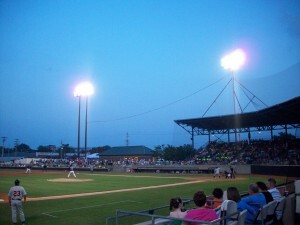 The Down East Wood Ducks brought back MiLB baseball to Kinston in 2017. Ballpark Breakdown: Most recently renovated in 2003, this park first opened its doors in 1949. This is obviously the biggest thing to do in Kinston, and the locals come out to support their team in droves. All of the seats immediately behind the baseline have been divided literally into “boxes” and with the help of folding chairs, serve as box seats for anywhere from 2-6 or even 8; which can be purchased for the season At the time of our visit, every single one was taken – mostly by local businesses. Behind the box seats, they have a large covered reserve section, and bleachers way down the third base line, which are general admission, and of course there is the obligatory picnic pavilion, which was closed during our visit. They don’t serve Mother Earth beers here – and prices of both beer and swag were both a bit higher than expected for an out of the way place, but with $6.00 reserved seat tickets, the costs balance each other out. The last thing we expected to find in the middle of rural North Carolina (and we mean rural! 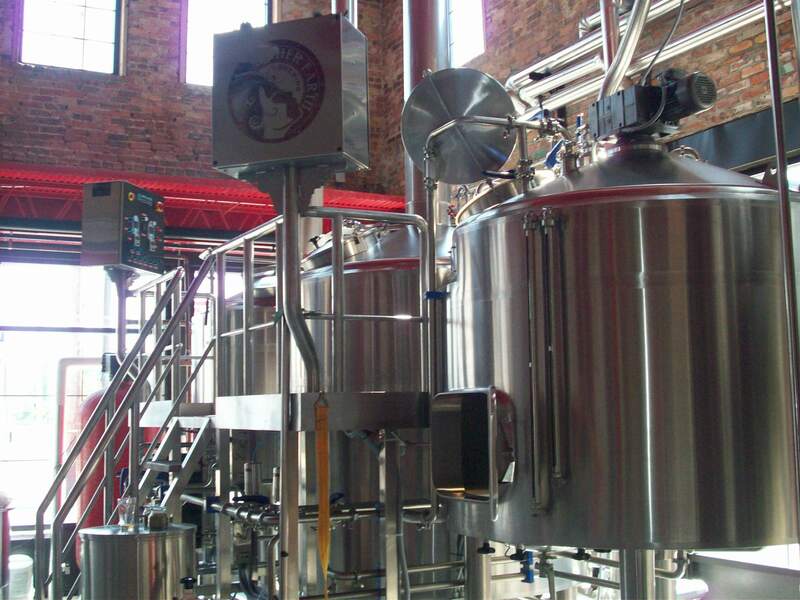 ), was a modern building housing a progressive and earth friendly brewery, but that’s exactly what we found at Mother Earth; a new brewery that takes up a city block, and runs entirely on solar power. Greeted by small town southern charm, we were able to sample some beers at the bar before going along on the (free) tour, where they let us taste the hops, enter the barrel room where their Bourbon Barrel Stout Tripel Was curing, observe the fermentation and bottling processes, and even climb on the machinery for photo ops. 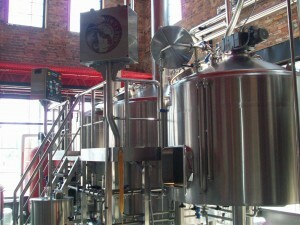 Our only complaint was that there wasn’t a beer refill station along the tour route. The tasting room is brand new renovation in an old building, and mainly done with light wood and large windows that let in a ton of sunshine, and a view of their large courtyard. Tables and couches run along the sides of this room, while a rectangular metal bar with seating on all four sides is the centerpiece of the room. We met a bunch of great people from the friendly bartender and welcoming locals, to one of the brewmasters who arrived in Kinston by way of Hawaii, Chicago and Savannah, basically for the love of beer, and taught us step by step the process of brewing – from recipe to warehousing. Warning: this one is only open on Thursday, Friday and every other Saturday, and the menu consists of handfuls of pretzel mix – but if you can fit it in your schedule, it is well worth the trip! Brew Breakdown: Even if you drink it out of the glass, be sure to ask for the bottle – each label is as unique and creative as the beers themselves. Endless River – If Gillian was actually able to have an endless river of this brew, she would be a happy woman. A wonderful summer beer! Kölsch style, so it’s light and smooth with a citrus finish, similar to a Hefeweizen, but without the haze. Perfect anytime, but absolutely great on a hot summer day, like the Saturday we stopped by. Weeping Willow Wit – a classic wit beer with the spicy orange zest and haze you expect, but Mother Earth’s recipe includes coriander which gives it a tangy twist. Another great option to cool down a steamy summer. Darl Cloud Munich Dunkel – Manages to be dark and malty without filling you up. High ABV (though not as much as the Tripel below) which, as the brewguide explained is due mostly to the fact that it ferments three times as long as any of the ales they concoct. Tripel Overhead – a Belgian Style Tripel with a bourbon barreled twist. This one comes with a comes with a very bourbony (…yes, that’s a word) aroma and possibly because it’s a bourbon barrel tripel instead of a stout, the bourbon flavor is very distinct, and VERY strong. Jim fell in love with this one, and apparently the head brewmaster has too because he describes it on the Mother Earth website as “…quickly emerging as my preferred Mother Earth product.” This beer alone makes it worth the trip to Kinston, but isn’t for the faint of heart.